My best of 2011 is all done, though a tad bit late. Apologies. It was a good year for the blog though, with some 40-odd posts, nearly all music related, making this the year to beat in terms of content production. It’s still a little unevenly paced still, but we made it through the year without any huge gaps in updates, which I’m quite proud of! 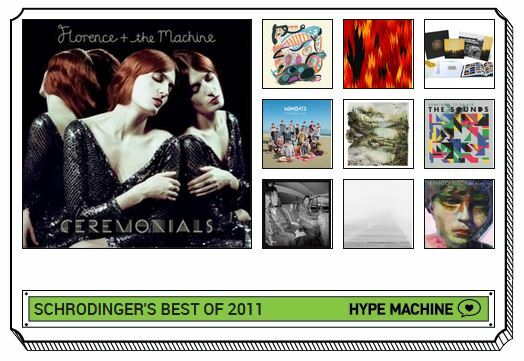 Without further ado, I have linked to the big list of the top albums of 2011. Below, for purposes of aggregation, is my Hype Zeitgeist widget.